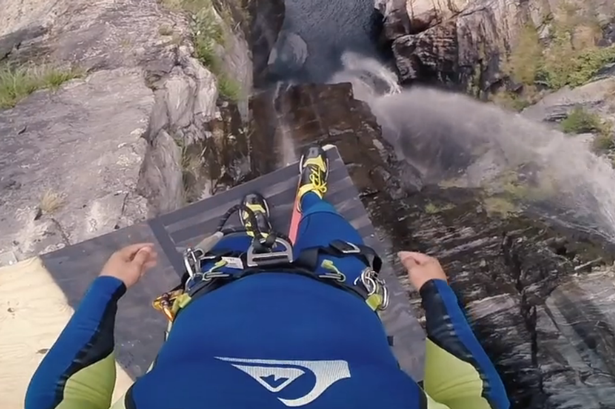 Laso Schaller, 27, undertook the absolutely crazy jump from a nearly 60m high cliff in Switzerland, into an 8m deep plunge pool below. This Brazilian born Schaller fearlessly leap from the Cascata del Salto, a peak in Tinico, the Italian speaking area of Switzerland. The descent only took four seconds entering the water vertically to avoid hurting himself.He emerges and swims over to land, where he stands up and walks out without too much difficulty. Schaller has a reputation as a fearless cliff jumper and in the past has conquered 20ft, 25ft and even 30ft drops without a second thought.